Yes, you read that right, and we'll explain it in a minute; but first, since we've got another lovely guest star to thrill and inspire you, please allow us to proudly introduce the lady in question: if you've played along with us at all, you'll recognize the name Lisa Hausmann, as Miss Lisa has been a loyal and beloved belle for all three years of our happy holiday card-making lark, so let's get to know her a bit better! "Hi there, I’m Lisa Hausmann, (find me on my blog Recklinghausen Musings), & I was thrilled to be asked to join in on this Christmas adventure with my favourite Belles. I’m first & foremost a scrapbooker but card making was a natural progress & since I discovered Jingle Belles, my Christmas card making hasn’t looked back. I’m a born & bred Brit, now happily living in Germany having moved here for love 12 years ago. My wonderful husband doesn’t seem to mind my paper fixation & our happy life gives me plenty of topics to scrap about. 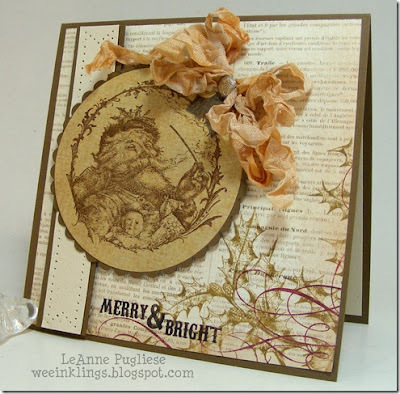 I am a challenge junkie & apart from Jingle Belles, you can find me at the Counterfeit Kit Challenge Blog where I’m a Master Forger as well as over at Whimsical Musings which is an inspiration challenge blog I co-host with weekly prompts to get your creativity wheels turning. If that wasn’t enough, I also participate in the LOAD (LayOut A Day) challenge three times a year (Feb, May and Oct – the next one is just a few weeks away & I can’t wait!). Yes, I create a scrapbook page every day for a month – he he! I’ve joined in 12 times now & completed 10 full months as well as two partial months – that means nearly 400 layouts! There’s not a lot of time for much else in my life but I also like dabbling in photography and exploring my new homeland." So what do we mean by, “Jingle Belles are BLING-ing”?! 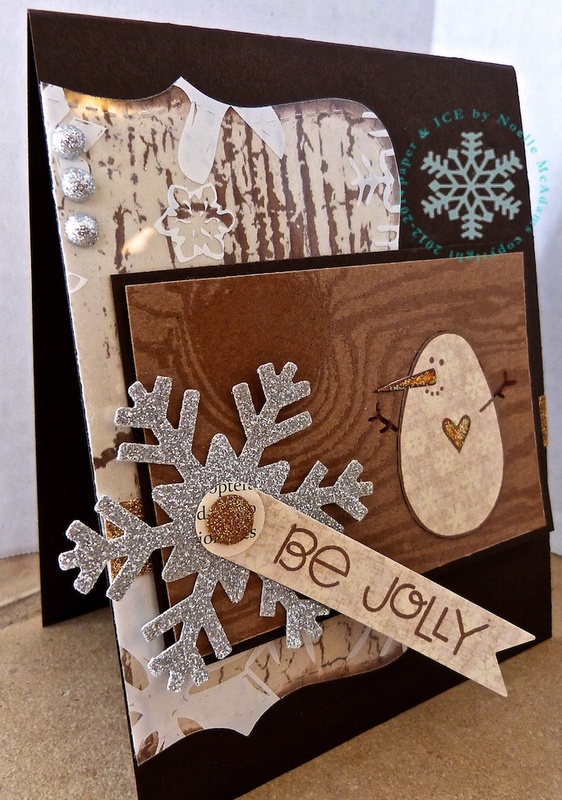 We want you to create a holiday card which incorporates bling, glitter, glitz, gems, shimmer, or anything sparkly! Lisa says, "Anyone who knows me knows that I’m all about the sparkle, so I jumped at the chance to come up with a Jingle Belles prompt that encourages all of you to join me on my glitter quest. I had so many ideas about what glitter, bling or shimmer to use so it took me some time to decide on this card topper that I recently picked up at a craft fair. The glitter detail is just beautiful so I hope you can see that in the photo. 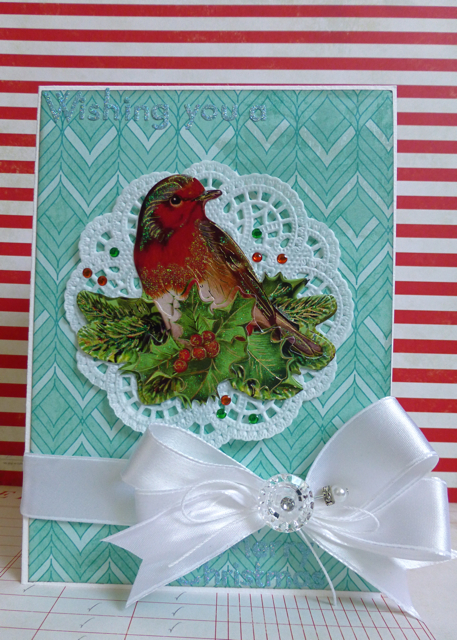 I picked out a modern aqua background to contrast with the old-fashioned robin design, but which also picked up the tones of the ready-glittered elements. I wanted to add more contrast so some satin ribbon in a big bow topped off with a clear sparkly button & a gem-topped pin added yet more different forms of shine. 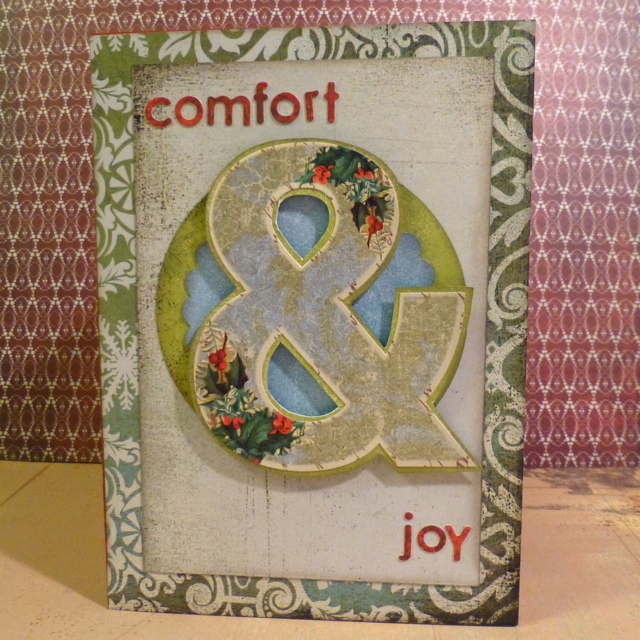 Some glitter letters blending into the background finished off this multi-blinged card." Stef says, "One might say my card is a case of *glitter-overload* since every single element has a glittery sparkle ... but we all know there is no such thing as *glitter-overload* in the land of Jingle Belles. I combined four different glitter papers, glitter stickers, and metallic sparkly snowflakes & sentiment using a sketch from The Paper Players ... sparkle-on my friends, sparkle on." 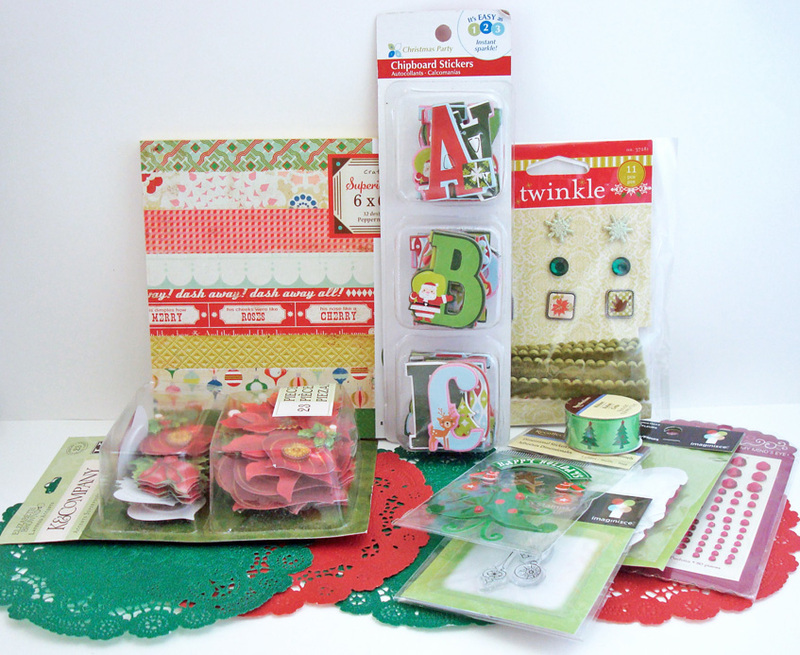 Lauren says, "It's no secret that I love all embellishments, and the sparkly ones most of all, so I doubt if anyone is surprised to see me make a super-loaded ultra-embellished collage with multiple bling ingredients! I've got a self-adhesive, heart-shaped bling border, a rhinestone flourish that i recolored with alcohol markers, some glimmery brads, and (though it's hard to see in the photo, sorry!) 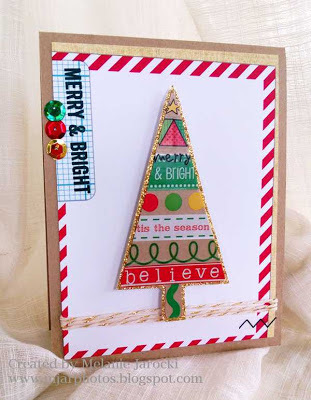 my stripey paper is the sort which came already encrusted with tiny bits of glitter in the design, so I've got all the shine with NONE of the mess--awesome!" So put on your most glamorous thinking cap; dust off your bling flourishes, your glitter glue, and your tiny rhinestones; and prepare to dazzle us with jewels, gems, sparkle and shimmer! Link your glitziest holiday creations here by 6pm (EST) on Wednesday, April 10th. Keyword for galleries and our flickr group is JB:13:07. Not only stamped this very elegant black and gold silhouette card, she also impressed with this beautiful kraft snowyscape! Patti Corriere of What Are You Inking? Takes *ALL* the fear out of "going grey" with this amazingly lovely monotone masterpiece! Shows how to rock the details along with the neutrals with her stunningly embellished Santa! congrats to you, Jessi, and please email us at jinglebellesrock @ hotmail [dot] com to claim your prize! 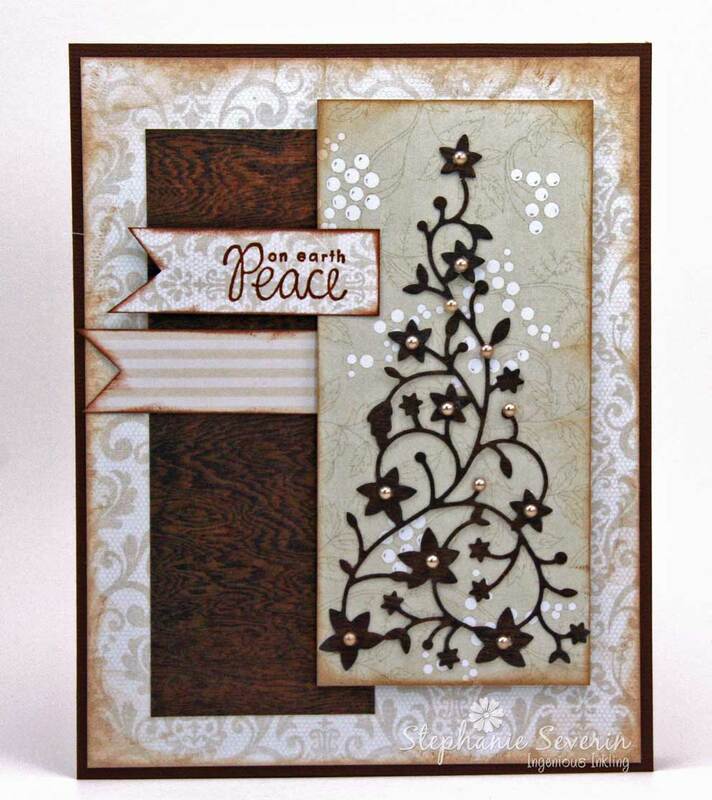 Noelle says, "I wanted this card to be rustic and elegant with a touch of whimsy. This card has lots of fun layers to add to the interest as well. 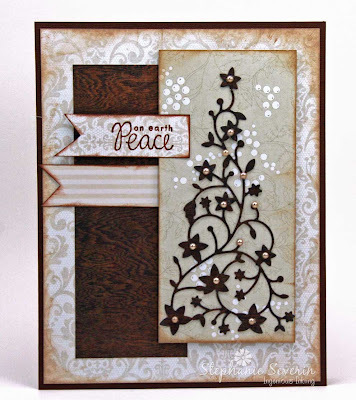 I started with a chocolate brown card and dry embossed it with a texture plate. 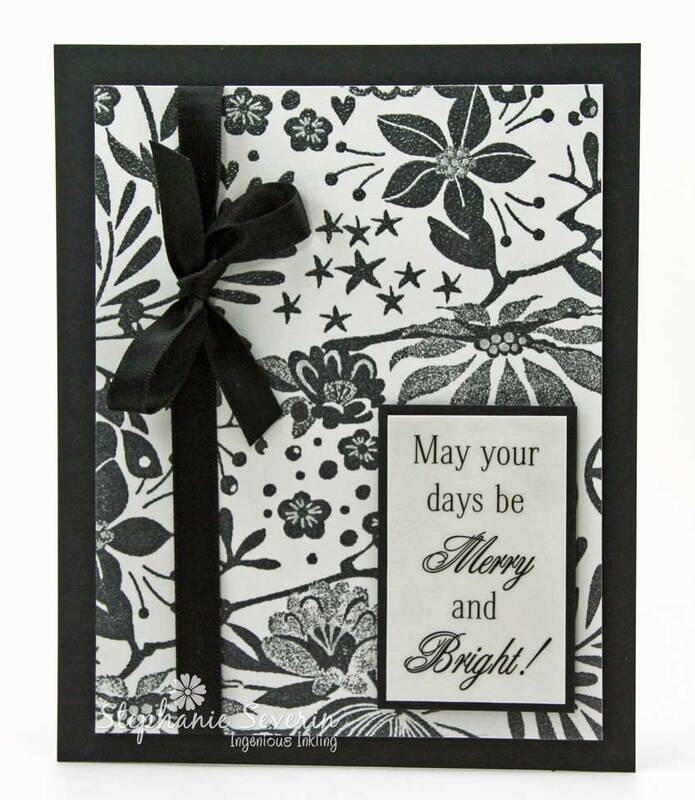 Following an older sketch, I cut an acetate scrap printed with snowflakes and a crackle print scrap of DP with the same die. I adhered them together with no adhesive showing by running the acetate through a Xyron. The rectangular panel was created with a scrap of kraft DP that has a woodgrain print on it. 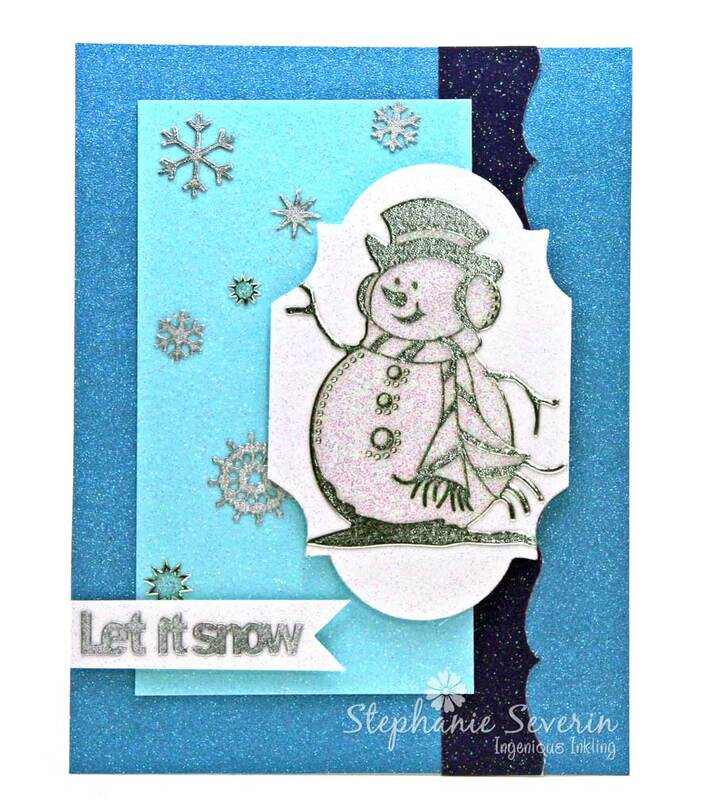 Cute Mr. Snowman was paper pieced onto that panel from a subtle snowflake DP. His nose and heart were colored with a copper pen (to keep it neutral!) and then some Stickles for a bit of added interest. 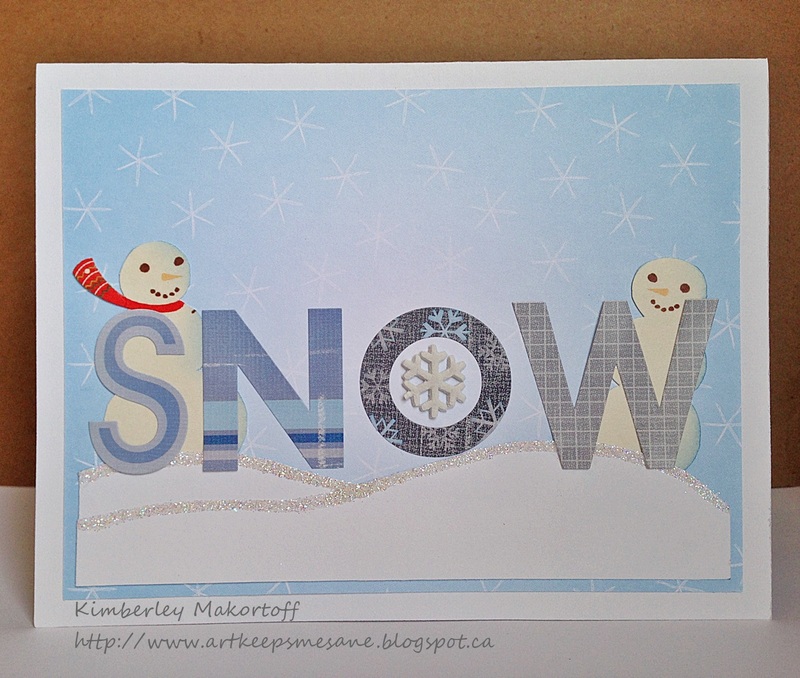 The final accent is made with a glittery silver snowflake and a stamped banner for the sentiment. " Lauren says, "One of my 'go-to' techniques for a limited palette is to embrace monochrome... and then realllllllllllly load up on both texture and different shades of the color I've chosen. On this card I've got bright white, off white, snowy white, pearl white, a couple of greyish whites, some glitter, a clear acrylic transparency, silk flowers with pearl centers, and some luscious vintage eyelet trim which was actually a gift from the aunt for whom i make a white-on-white card each year... and how thrilling that for 2013 I've already accomplished that mission!" 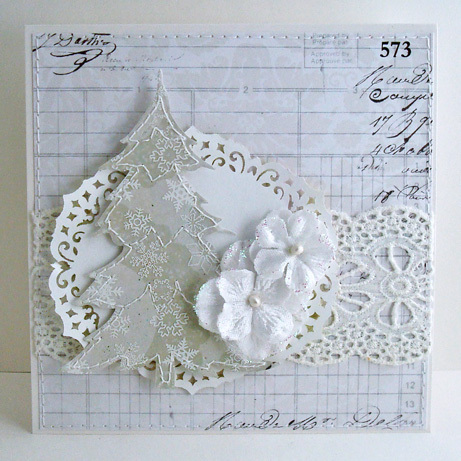 Stephanie says, "My card began with a Memory Box Flowering Christmas Tree die cut from wood grain paper. Next I layered on more neutral papers from DCWV's White Fern Stack. I finished with tan pearls to decorate the tree & a sentiment from A Muse using this week's Cardabilities Sketch." This week we're delighted to welcome the very lovely Noelle McAdams to the ♥JINGLE BELLES♥ house, so let's meet this talented lady! "Hi there! I'm Noelle McAdams and I have been a crafter and artist all my life. :) I got hooked on paper crafting in 1998 when my cousin asked me to host a Creative Memories party. I still scrapbook and I love stamping and making all kids of cards and decorative paper items, such as party favors, gifts, and home decor items. I am a mom to 3 boys, 1 cat, and 2 Pomeranians.... yes my life is a little chaotic (ok, a lot, but I like it that way!) ;). I've been married to my awesome hubby now for almost 17 years. We live in the beautiful hogbacks at the base of the Rocky Mountains. My background and education is in the performing arts, and I teach theater to kids part-time as well as being a full-time SAHM to my 3 boys. I also take on as much crafty/artwork/writing opportunities as humanly possible! 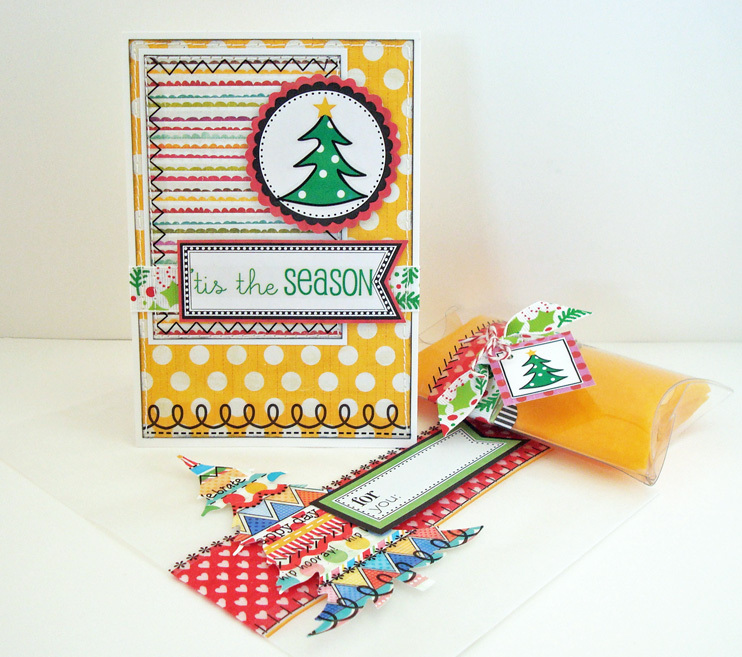 Currently I serve as part of the Cat Pack DT for the Cat's Pajamas stamps, and also as a Contributor for Craft Storage Ideas. When I'm not crafting or teaching acting to kids, you can find me enjoying time with friends, refinishing old furniture, and training for my first ever mini sprint triathlon." This fortnight, Noelle would like to invite us all to put on our thinking caps, and create holiday cards which embrace ONLY the neutral colors: white, cream, ivory, ecru, black, grey, charcoal, obsidian, brown, tan, kraft, camel, oatmeal, sienna; use them all together, or choose one and rock the monochrome, whatever you desire; if it's NEUTRAL, it's *IN*!!! And yes, for the record, we consider gold, copper and silver to be the "bling" equivalent of neutrals, so you may use them as much (or as little) as you'd like! 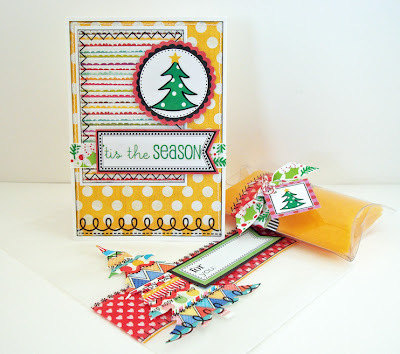 Noelle says, "I *love* color and normally use as much color as possible on my cards. However, recently I've found myself really digging on all-neutral cards. When you lose one of your "go-to" tools for adding interest (in my case, color) then you are forced to look elsewhere for ways to add interest. Texture, pattern, metallics, and glitz are all ways to do that without adding color. 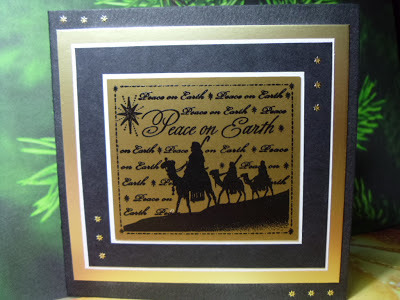 This was a simple card made with scraps of DP, and a dry embossed strip of gold cardstock as well. Simple stamping is used, and a glitzy paper-pieced ornament for the "o." I love adding some sparkle to an all neutral card. It really gives it the POP that I'm missing from no color. I added the die cut snowflake topper in sparkly silver to give this card that wow factor. 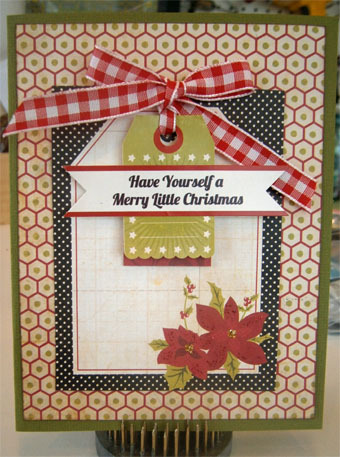 Some silver gems are the perfect accent and help draw your eye down to the bottom of the card as well." 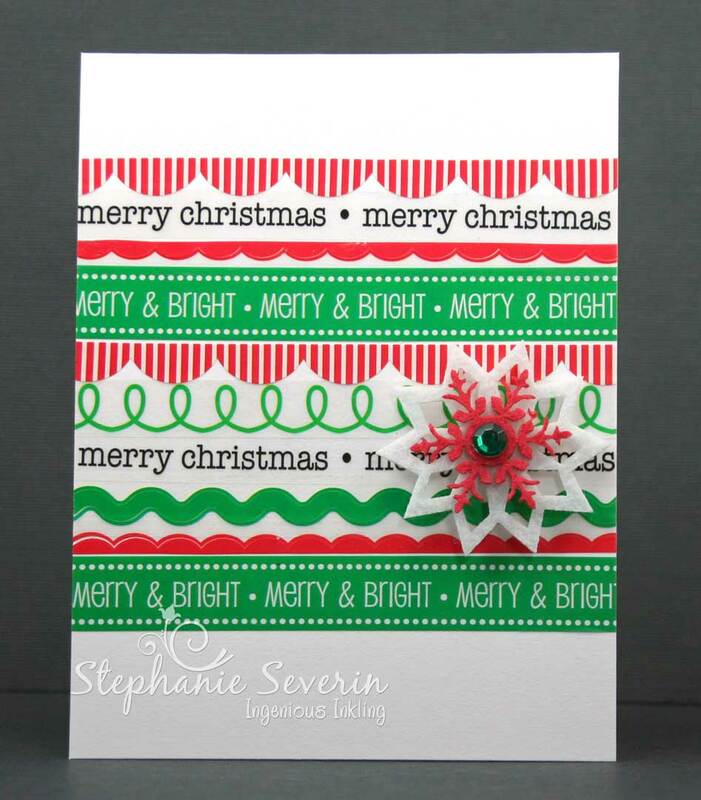 Stephanie says, "I love how a challenge like this one makes me think differently about my supplies. 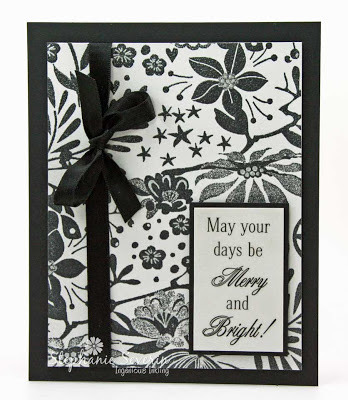 I think this gorgeous Hero Arts Aspen Frost Poinsettia stamp looks so elegant in charcoal ink on soft stone cardstock, but without thinking *neutral* I probably never would have tried this combination. I added several spritzes of pearl glimmer mist for all-over sparkle as well as highlights from a silver glitter pen to the centers of the bloom. I used an SRM Sticker sentiment (loved the *bright* pun with my neutral palette) on top of a scrap of the pearly sprayed cardstock & an elegant black bow tie to finish the design." Lauren says, "Much in the same way Noelle described, whenever I find myself limited in color, i also immediately start thinking about texture and dimension. 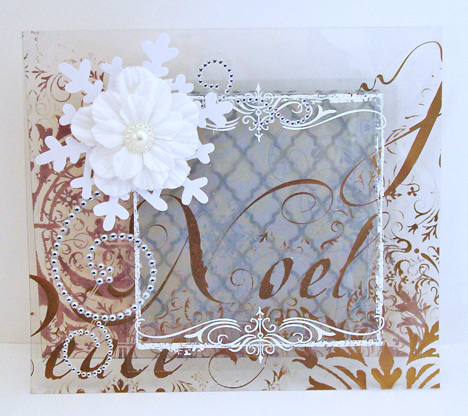 This relatively flat card actually has SIX layers: three different transparencies, a patterned paper, a vellum, and then my embellishments on top--a collage of floral, snowflake and rhinestone swirls. i unexpectedly got a "bonus" layer when i scored and folded that swirly gold transparency for my card-base, and discovered that the reverse side of it is copper!" 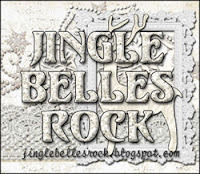 We're celebrating a couple of fun blogiverse milestones this week: our 200th post and 100,000 page views, for which we thank you very much, ♥JINGLE BELLES♥! Around here, we think that celebrations ought always to include presents, so there will be a little prize packet of Christmassy goodness randomly awarded to one lucky holiday cardmaker who links up with us for this prompt! 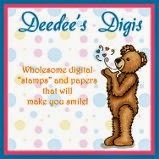 6x6" Crate paper pad; chipboard alphabet stickers; Making Menories trimmings and brads; Imaginisce florals and stamp; dimensional die-cuts, stickers, ribbon... and MORE! 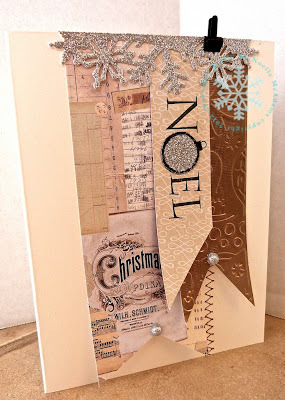 So grab up your kraft cardstock, your black embossing powder, your white doilies and any other neutral-colored supplies you can think of, and get as creatively christmassy as you possibly can, then hop back here and link up with us for a NEUTRAL NOEL by 6pm (EST) on Wednesday, March 27, 2013. Keyword for galleries and our flickr group is JB:13:06. Love those fun little holiday elves ... so perfect with that round little Santa ... and the red wood grain trim is the perfect finishing touch. 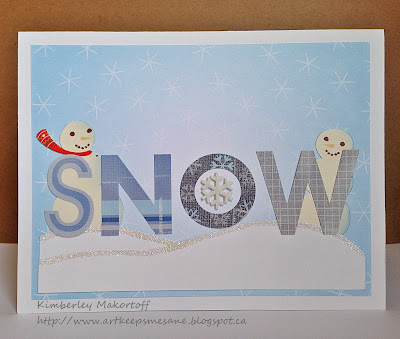 She totally rocked the letter stickers combining four different patterns, but tying them all together with her cool blue hues ... love how the snowmen are peeking through that glittery snow-scape too. She turned this big bold ampersand into a gorgeous design element ... and love those perfect tiny letter stickers for the perfect holiday sentiment. Brenda sent us your mailing address to jinglebellesrock at hotmail dot com so we can get your SRM Stickers on their way. 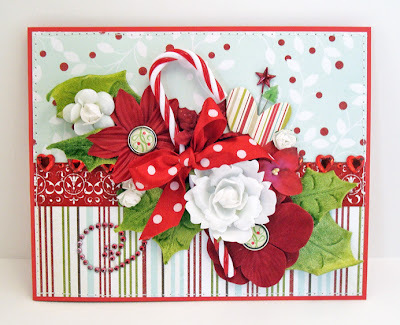 Join us at midnight for another fun holiday card prompt ... with a very talented lovely guest star. We're still celebrating STICKERS this week with SRM Stickers ... remember, there's an awesome prize package up for grabs for one lucky participant. 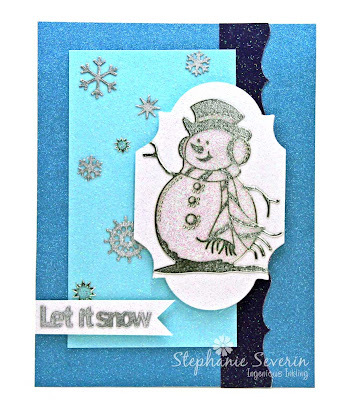 Stephanie says, "I used lots of stickers from the SRM Stickers' Fancy Sticker Sentiments (including border stickers on my paper flags) for my design together with Carta Bella Winter Fun papers and a sketch from Sunday Stamps (I stamped some tiny little vintage Stampin' Up Snowflakes in the corners ... because stickers and stamps are the perfect playmates)." Lauren says, "I had a completely different plan for this week, but every time I saw the sheets of SRM's awesome Labels By the Dozen sitting on my work table, they kept screaming, "ORNAMENTS!" to me, so eventually I gave in and made that card, instead! 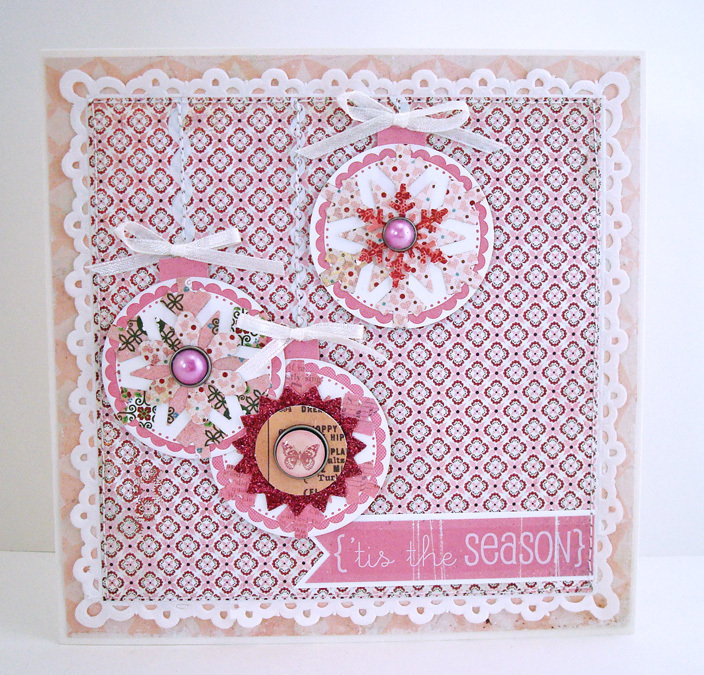 :) I layered the three pink circle shapes with various snowflake diecuts, punches, and brads to fancy them up, cut little "necks" for the tops, and then placed a couple of "We've Got Your Border" stickers on the background paper to act as hangers. One of the white sentiments from the "We've Got Your Stick-Merry" sheet made the perfect finishing touch!" Remember, you have until Wednesday, March 13th at 6pm EST to link-up your card featuring at least one STICKER. We're thrilled to have the fine folks from SRM Stickers joining us for our current holiday card prompt we're calling ... Stick-y & Sweet ... create a holiday card or project featuring at least one sticker. SRM Stickers is a leading sticker and container manufacturer. 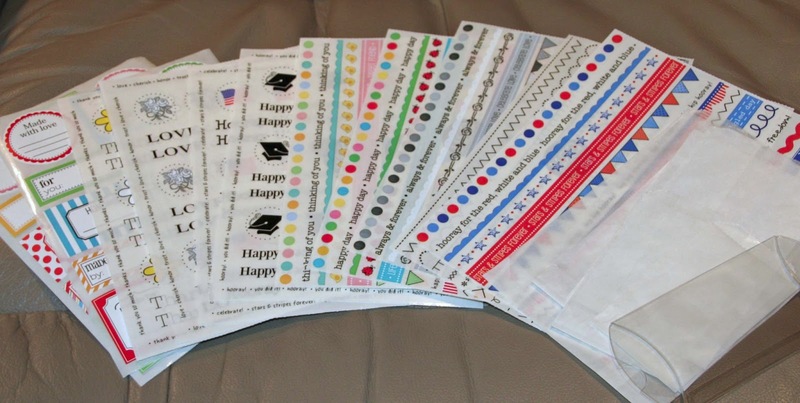 SRM Stickers are crystal clear and melt into your patterned paper or cardstock for a seamless sentiment, embellishment, title, or journaling feature. SRM also carries fun-to-decorate containers such as tubes, pillow boxes, and glassine bags! 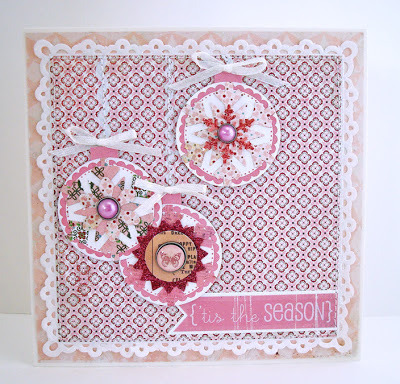 SRM Stickers has assembled a dream team of Designers offering amazing samples every weekday at their blog. SRM products can be purchased through their online retail store. And ... one lucky participant will win this amazing SRM Sticker prize package that includes stickers for almost every occasion as well as some of those cool glassine bags. Melanie says, "First, I cut out the tree shape and then layered the We've Got Your Border Christmas Stickers on top of it. Then I matted it with gold glitter paper. I adhered the tree with foam adhesive to a journaling card and finished off the card with Gold Shimmer Twine and sequins." Stephanie says, "One of my favorites are the fun We've Got Your Border Stickers from SRM. I used the Christmas Borders & white cardstock to create this fun holiday design. 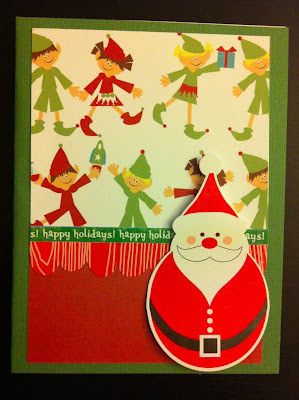 I finished with some layered felt snowflakes and some green Christmas bling (sketch is from the talented Lucy)." Lauren says, "I am absolutely in love with SRM's glassine bags and clear pillow boxes, and since the SRM stickers really do go on completely clear, you can just go to town decorating them... so i did, lol! there are more photos of this little gift set, as well as a complete product list on my personal blog, but you can see right off I've used a Large Glassine Bag, a Medium Pillow Box, We've Got Your (Merry) Stickers, a bunch of We've Got Your Border Stickers tons of Sticker Stitches and some Labels By the Dozen; I was also inspired by this week's Unscripted Sketch for my card!" So pull out those stickers (FYI they don't need to be from SRM to join the fun!) and make some holiday magic ... we can't wait to see what you create. Link up here between now & Wednesday, March 13th at 6pm (EST) for a chance to win the wonderful SRM Sticker Prize Package. Keyword for galleries & our Flickr Group is JB:13:05 and make sure you add them to the SRM Stickers Flickr Group too if you use their products.